Not all dentures are the same! At My Clinic we use IvoBase Precision Dentures for the most accurate fit because it’s more than a denture, its your smile! 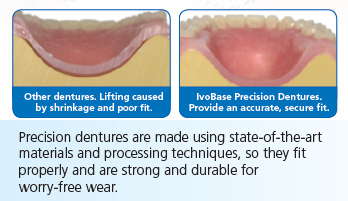 Find out more about IvoBase dentures here. With decades of experience, Pieter Oosthuizen offers the residents of Jacksonville and surrounding areas the best in denture care available today. My Denture Clinic provides quality dentures and denture services to patients in Jacksonville, Medford, Central Point and surrounding southern Oregon communities. Our friendly and caring staff is ready to serve you in all your denture needs. So when quality counts, as well as cost, you’ll always find the best of both at My Denture Clinic. Our office is located in historic Jacksonville. Our professional and comfortable office offers a peaceful atmosphere and front-door parking. Do you feel self-conscious about your dentures? Do you suffer from denture problems? Do you have worn down teeth, gum disease, failing crowns and bridges, or loose partial dentures? Are many of your teeth loose and do you fear the worst? Do you look older as a consequence and want to reverse the signs of aging? If the answer to any of the above is YES then visit us and see the difference we can make to your life. © 2019 My Denture Clinic - Dentures in Medford and Southern Oregon.